The Philadelphia Eagles had a 7-4 record and were leading the NFC East as they hosted the San Diego Chargers on December 9, 2001. Under third-year Head Coach Andy Reid the team ran a pass-heavy West Coast offense directed by QB Donovan McNabb. Defensive coordinator Jim Johnson’s aggressive, blitz-heavy unit tended to give up rushing yards but had an outstanding defensive backfield anchored by FS Brian Dawkins (pictured at right). The Chargers, under Head Coach Mike Riley, had gotten off to a surprising 5-2 start but then lost five straight and were 5-7 coming into the game at Philadelphia. 39-year-old QB Doug Flutie was beginning to fade down the stretch, but rookie RB LaDainian Tomlinson was proving worthy of his first-round draft selection. The defense was tough against the run but had difficulty holding onto leads. On their first possession of the game, which was set up by a 32-yard punt return by RB Brian Mitchell, the Eagles drove 63 yards in six plays. Highlights were Donovan McNabb passes to RB Duce Staley for 28 yards and 31 yards to WR James Thrash that set up a one-yard toss to TE Chad Lewis for a touchdown. The Chargers made a big play on their next series when Doug Flutie threw a pass that WR Jeff Graham caught by reaching around CB Troy Vincent, who had his back to the throw, and tipping the ball to himself - he then took it all the way to the end zone for a 61-yard TD. With the addition of the extra point, the score was tied at 7-7. Following a punt by the Eagles on their next possession, it seemed as though San Diego might be on the way to another score. Flutie connected with WR Tim Dwight for a 29-yard gain into Philadelphia territory and a nine-yard completion to LaDainian Tomlinson had the Chargers at the 38 yard line. But on the next play, Tomlinson was unable to maintain control of a pitchout behind the line of scrimmage and Brian Dawkins proceeded to scoop up the ball at the San Diego 49 and return it for a touchdown. Rather than potentially giving up more points, the Eagles were ahead by 14-7. Once again the tenacious Chargers advanced into Philadelphia territory, but this time CB Bobby Taylor picked off Flutie’s pass at the 24. The Eagles didn’t capitalize this time, but San Diego still had come up empty. In the second quarter, the Chargers put together another promising drive. In eleven plays, they moved from their 24 to the Philadelphia 16 with Tomlinson running for 16 yards in four carries and Flutie completing a 17-yard pass to WR Curtis Conway in a third-and-14 situation. But again they failed to put points on the board when Steve Christie’s 34-yard field goal attempt was unsuccessful when it hit the upright. After the teams traded punts, it was time for the Eagles to put together a scoring series. With the ball at their 19 yard line to start, McNabb tossed a screen pass to Staley on first down for a 37-yard gain. Facing fourth-and-one at the San Diego 35, McNabb completed a throw to Thrash for 24 yards to the 11 and three plays later Staley caught an eight-yard touchdown toss. The first half scoring wasn’t over, however. The Chargers, now down by 14 points, responded by going 71 yards in seven plays, six of them Flutie passes and one of them an 11-yard carry by the diminutive quarterback. The big completion along the way was for 29 yards to Conway and the series ended with Flutie tossing a 10-yard TD pass to Graham. The score was 21-14 in favor of the home team at the half despite Flutie’s 229 passing yards. The Eagles defense dominated the anticlimactic second half as the Chargers, who had moved the ball effectively but had difficulty scoring in the first half, were unable to penetrate Philadelphia territory again until late in the fourth quarter. Philadelphia started off the third quarter with a long drive that stalled at the San Diego 36 and resulted in Sean Landeta’s punt pinning the Chargers down at their five, and from there the battle for field position worked against the visitors (Landeta punted 10 times during the contest). In the fourth quarter, Dawkins made another big defensive play for the Eagles when his tackle of Flutie forced a fumble that was recovered by DT Hollis Thomas at the San Diego 26. It set up a David Akers field goal from 37 yards that proved to be the last score of the game. San Diego’s last-gasp effort began with 5:29 left on the clock. Starting at his four yard line, Flutie hit TE Freddie Jones on passes that covered 34 and 20 yards and then followed up with a throw to Dwight for 13 yards to the Philadelphia 29. However, after reaching the 19 the Chargers were forced to try for a field goal and once again Christie missed, this time from 37 yards. That ended any comeback hopes and the Eagles won by a final score of 24-14. The Chargers actually outgained the Eagles (393 yards to 273) and had more first downs (18 to 14). However, San Diego also turned the ball over four times, to two by Philadelphia, and was penalized seven times, at a cost of 67 yards, to four flags thrown on the home team. Donovan McNabb completed 22 of 44 passes for 221 yards with two touchdowns and an interception and, tellingly, was also the club’s leading rusher with 39 yards on 7 carries. Duce Staley had difficulty against San Diego’s tough run defense and gained just 21 yards on 15 attempts, but was more effective as a pass receiver with 5 catches for 88 yards and a TD. James Thrash and WR Todd Pinkston also had 5 receptions, for 74 and 17 yards, respectively. 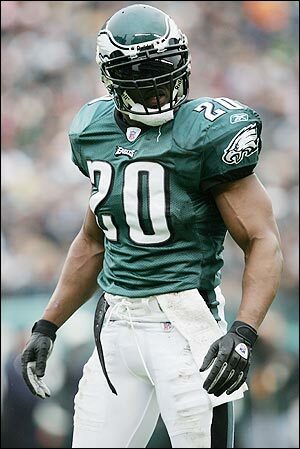 Brian Dawkins had a noteworthy defensive performance as he recorded eight tackles, forced a key fumble, and returned another fumble for a touchdown. For the Chargers, Doug Flutie (pictured below) went to the air 44 times and completed 20 of those passes for 307 yards and two TDs with two picked off. He also ran 8 times for 45 yards. LaDainian Tomlinson gained just 51 yards on 19 carries and had the fumble that led directly to an Eagles score. Jeff Graham led the receivers with 5 catches for 110 yards and two touchdowns. “We fought our tails off, but they have a good defense,” echoed Doug Flutie. The Eagles went on to win the NFC East with an 11-5 record, advancing to the conference title game before succumbing to the Rams. San Diego failed to win another contest and ended up at the bottom of the AFC West at 5-11. 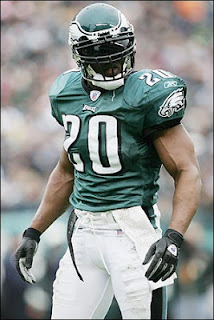 Brian Dawkins, in his sixth year out of Clemson, gained first-team All-NFL recognition for the first of an eventual four times and was selected to the Pro Bowl for the second of eight career occurrences. He intercepted two passes, recovered two fumbles, and was credited with 58 tackles. Duce Staley’s rushing and receiving totals against the Chargers proved to be typical of his performances throughout the season. He ended up rushing for 604 yards on 166 carries (3.6 avg.) and two touchdowns and gained another 626 yards with 63 pass receptions (co-leading the club along with James Thrash) for a 9.9 average gain and two more TDs. In his last full season as a starting quarterback, Doug Flutie passed for 3464 yards and 15 touchdowns along with a NFL-career high 18 interceptions. Still nimble late in his career, he also rushed for 192 yards. The ex-Boston College star continued as a reserve for four more years, three of them backing up Drew Brees, a rookie in ’01, before finishing out his career behind Tom Brady in New England.